If you've got Thai food on the mind, a recent opening is need-to-know. The new addition to South Shore, Monkey Thai, is located at Alameda South Shore Center, around the corner from TJ Maxx. 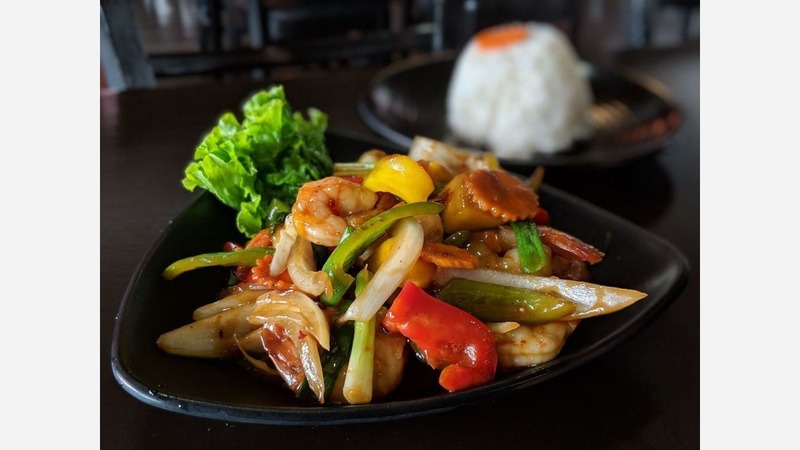 On the expansive menu, look out for a variety of options, including chicken curry noodle soup ($13.95), Thai sausage ($8.95), pineapple fried rice ($13.95), beef pad Thai ($10.95) and pumpkin curry with chicken ($12.95). If you swing by for lunch, you can get the monkey combo, which comes with an appetizer, an entree, Jasmine or brown rice and a drink. With a 4.5-star rating out of 25 reviews on Yelp so far, Monkey Thai has already made a good impression. Tracy S., among the first Yelpers to review the new spot on June 17, wrote, "Nice decor all around. The workers are very friendly and helpful. Today I ordered to go. I tried the crab fried rice. Very tasty and yummy! you have to try it." Yelper Scott L. added, "MT's menu is mostly individual entrees with rice. Appetizers, soups, salads, and the pads are family-style shareable while the rest are large individual entrees. Shared the papaya salad, tom ka gai soup, and pad Thai." Monkey Thai is open from 11:30 a.m.-midnight daily.